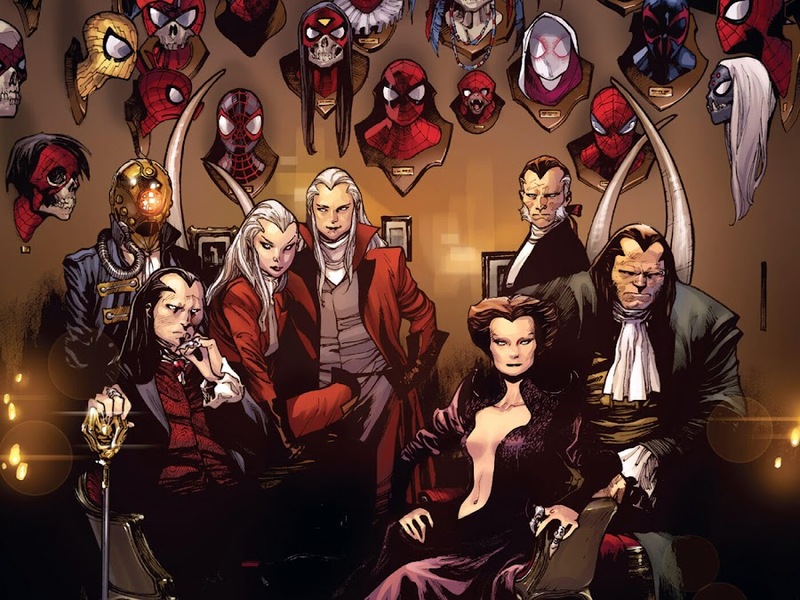 Morlun and his deadly family of Inheritors are coming after every single Spider-Man of The Multiverse and chances of survival is slim. Peter Parker is back in his own body as the Amazing Spider-Man after one of his greatest foe Doctor Octopus had taken control over it by swapping consciousness with him a while ago. Back in action after months, he also discovers that there was another girl named Cindy Moon, bitten by the same spider that gave him powers in the first place. 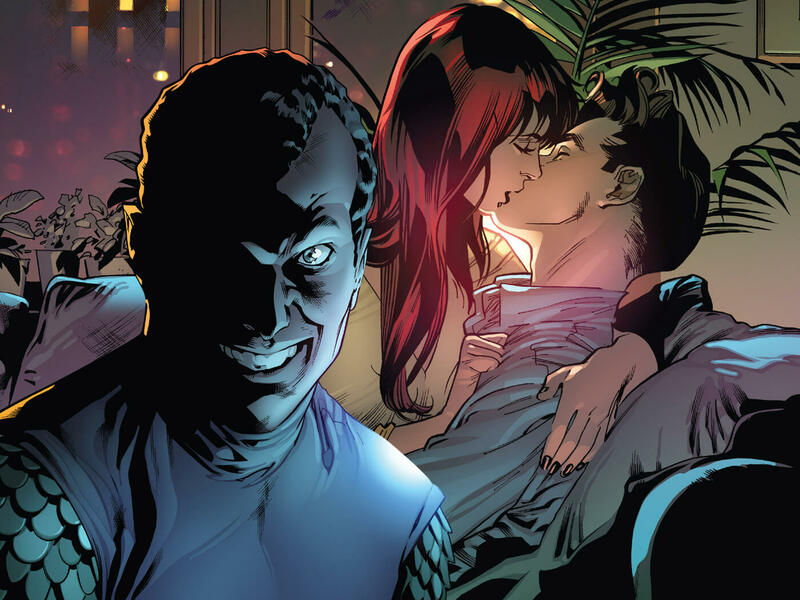 The moment she was freed; her existence is revealed to Morlun through her scent, he recognizes her as "Spider-Bride" and states that The Great Hunt has begun. So he goes to Earth-311, where Peter Parquagh AKA The Spider was doing a stage show at Globe Theater and beat him to submission before devouring his essence. 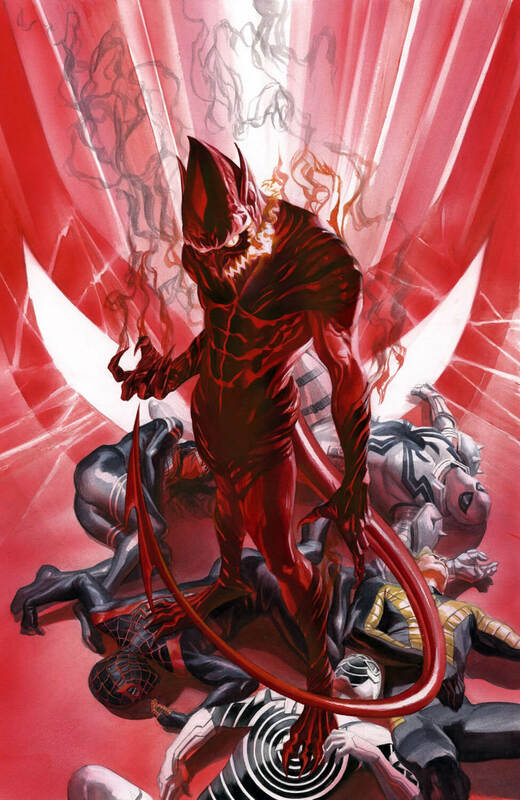 Following an incident at Horizon Labs, Superior Spider-Man ended up in 2099 of Earth-TRN588 as but is aided by Gabriel O'Hara, brother of Spider-Man 2099. He gave Otto a halo-agent, which is an AI form of Anna Maria Marconi to help him go back home. 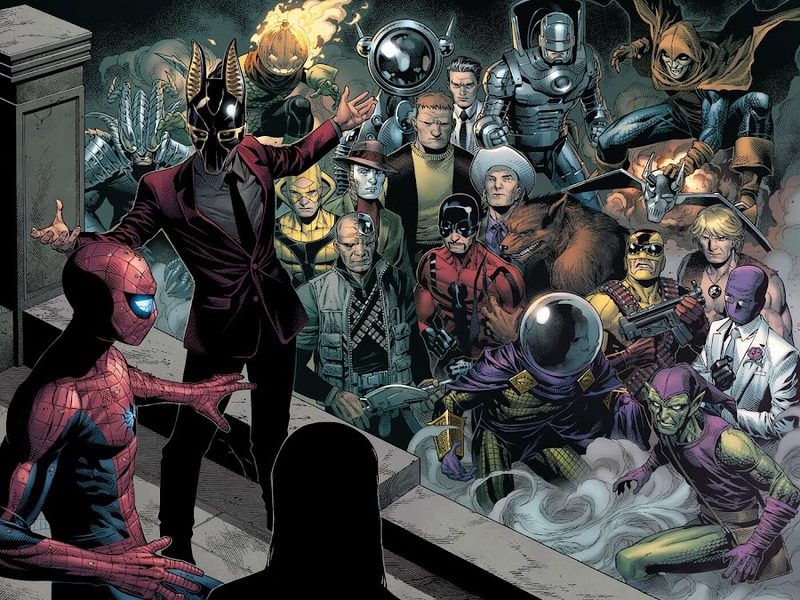 However, he reached parallel universes to discovering his counterparts from other realities of Civil War, Fantastic Five, House of M and one wearing Spider-Armor MK deceased. 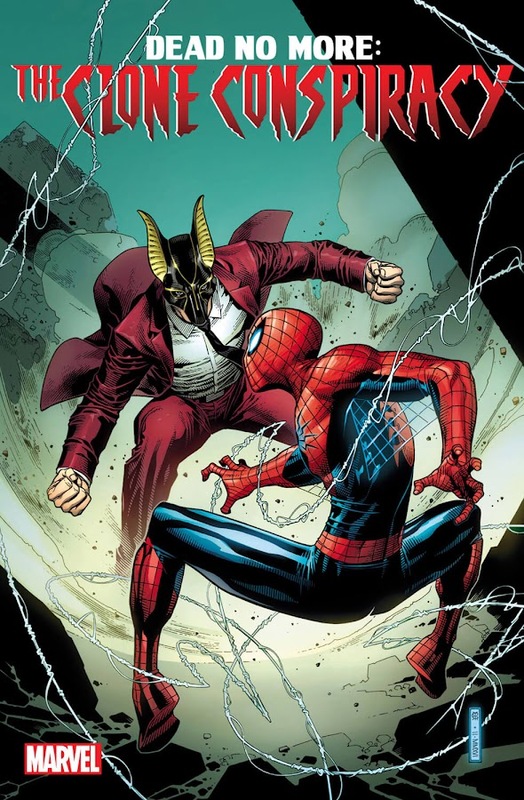 He then bumped into Morlun's estranged brother and one of the Inheritors, Karn chasing after Spider-Man India of Earth-50101, whom he rescued and recruited into a Spider-Army. Otto already has assembled Spider-Monkey, Spider-Man Noir, Six-Armed Spider-Man and Spider-Girl of "Old Man Logan" reality. He heads for the one from Earth-8351, who moved away from New York to Russia, have even killed Kraven the Hunter in past and was trained with Wolverine before being attacked by Karn. Octavius arrives just in time to save him from imminent death. When the monster was chasing Cyborg Spider-Man of Earth-2818, the Spider-Army ambushed on him but he quickly threw them off balance. Cyborg and Six-Armed Spidey are taken down in a sudden sneak attack by Karn's Inheritor siblings Brix and Bora. Fallout between the three Inheritor family-members creates a distraction that allows Otto and his team to retreat. Back in his base, he tasks Cyborg to look for anything related to these hunters. He then sent Spider-Man India and Noir to locate the home dimension of Karn while Spider-Monkey and Six-Arms go to check for more attacks. Meanwhile, Karn goes hunting Spider-God Ai Apaec while recollecting past events of his family going against the Great Weaver. His brothers and sisters fell against Master Weaver and his mother paid the price with her life when he hesitated. A mask is placed on his face as a reminder of shame and he started hunting solo. Peter wakes up on a call from J. Jonah Jameson shouting at him to go over Armstrong Park and take pictures of a villain who is wrecking havoc there. When they came face to face, Spider Moon-Man couldn't even land a blow before getting devoured by Morlun. He then returns to his family on Loomworld and his brother Daemos confronts him about his recent hunt. Upon his sister Verna teasing him, Daemos states that he has been avoiding a specific thread of entire Multiverse but he former disagrees and tells the latter to stay away from it as he has saved it for last. Daemos then recalls it as Earth-616. Peter Parker wakes up seeing Cindy Moon next to him, who suggests that he should move to another city as she can take care of New York. They go outside bumping into Looter in a Spider-Tank stolen from Superior Spidey, who is taken down by the arrival of Anya Corazon AKA Spider-Girl, Spider-Woman and Spider-Man 2099. Mayday Parker as Spider-Girl, Spider-Ham and Spider-UK showed up as well to warn him, because he faced one of them and lived. In Mountain Wundagore, Daemos decimated Justice, Nova, Sun Girl and Water Snake of New Warriors looking for Scarlet Spider. When he proceeds to feed on Kaine, he stabbed the hunter with spikes and actually hurt him, causing Daemos to realize that he is the Other. Three different Spider-Men came through a portal to rescue Scarlet Spidey. One of them appears to be Gwen Stacy, whom Kaine thought as a clone but Ben Reilly of Earth-94 vouches for her. Bruce Banner Spidey bites the dust and Old Man Spider led the others away. They all regroup at safe zone protected by Cosmic Spider-Man, who came with infant Benjy Parker. In Ultimate Universe, Miles Morales is attacked by Verna and her hounds. He is rescued by Superior Spidey and his team before they could feast on him. Peter Parker of Earth-616 is being deemed as the "Chosen One" by every other Spider-Totem, because of his track record with Inheritors. When he comes face to face with Otto, a fight among the Amazing and Superior Spider-Man will determine who will lead their creed. The Inheritor family are currently after the receptacles of powerful totemic entities; The Other, The Scion and The Bride for a ritual to avert a crisis on them. They attack on them and only an unlikely ally can help the heroes save the day. For more information on Spider-Verse event, you can check out these links below. 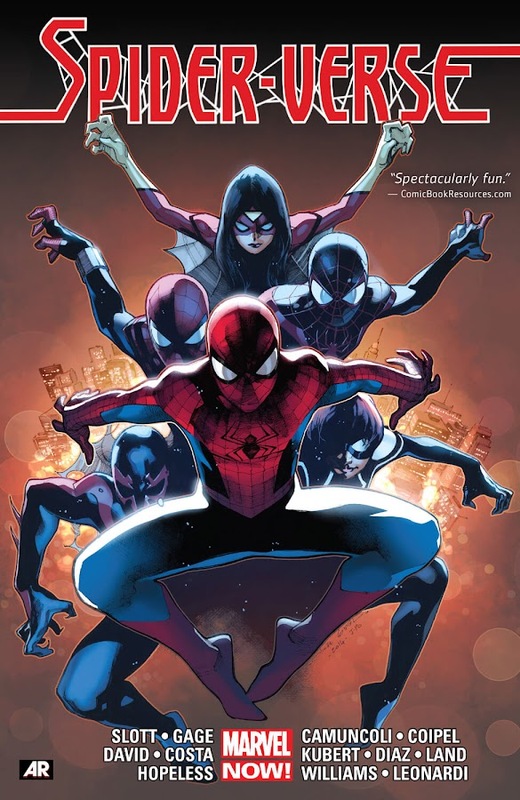 Here is your links to buy "Spider-Verse" from Marvel Comics in issues on Amazon. 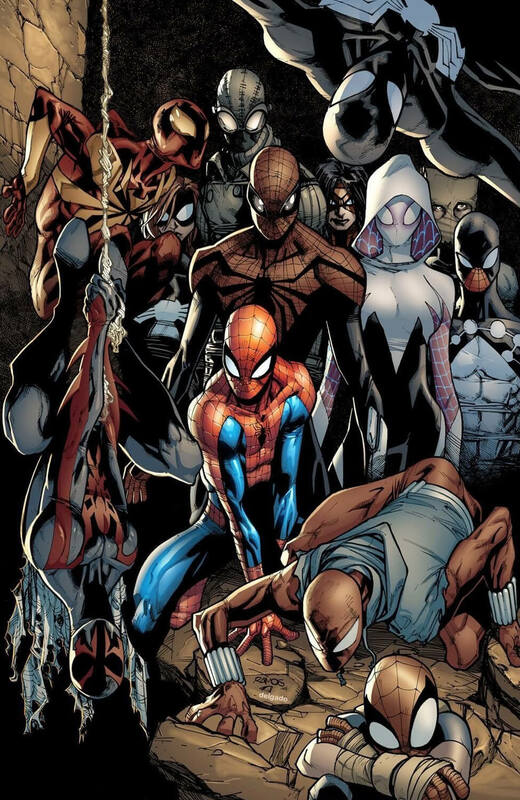 Here is your links to buy "Spider-Verse" from Marvel Comics on Amazon. 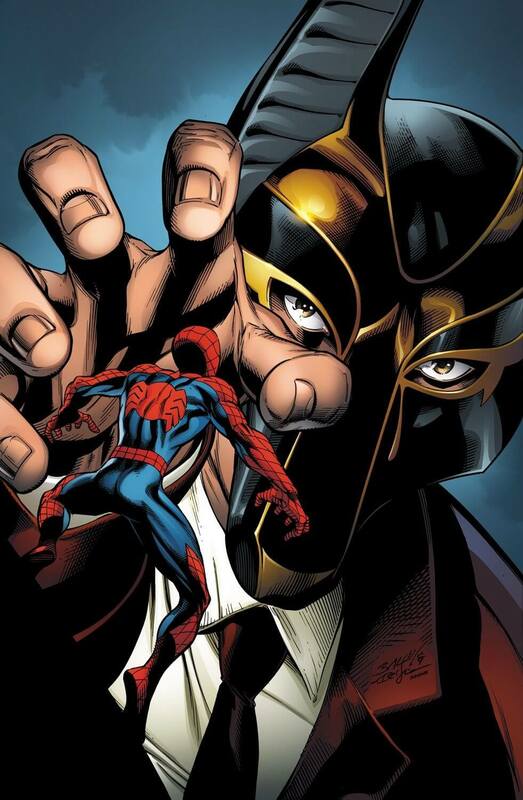 A crossover event in the making since "Coming Home" arc, when our friendly neighborhood wall-crawler met one of his adversaries who made him run and opened new doors of secrets and possibilities connected to his origin. Lately, a "Superior" Spider-Man has been taken over but our "Amazing" hero is back again to settle scores. An army of spider-powered heroes from many dimensions gather to fight back a family of hunters, who fed upon them as prey. 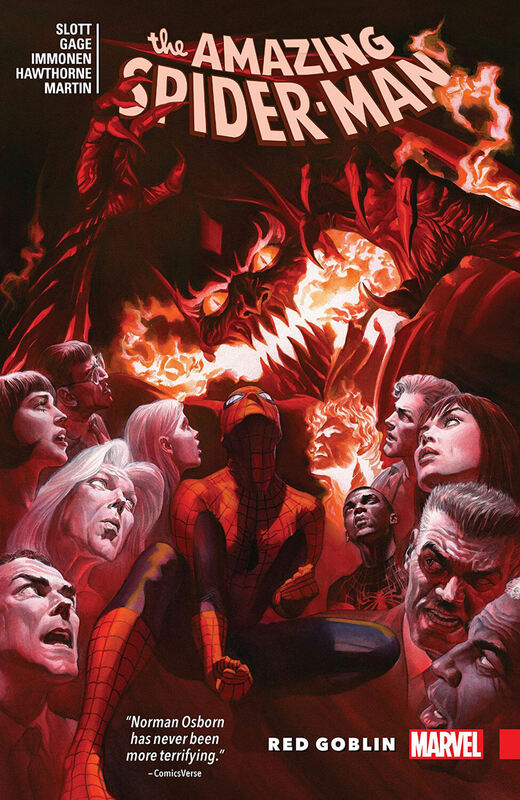 After tying-in with "Original Sin" event during "The Parker Luck" storyline, "Spider-Verse" found a solid foundation to create an impact over alternate realities in 2016 and a sequel titled Spider-Geddon is scheduled for 2018. Marvel Comics brought in renowned comic-book writers Christos Gage (Civil War – House of M, Thunderbolts – Secret Invasions), Dan Slott (Spider-Man – Big Time, Spider-Man – Dying Wish) and Peter David (Incredible Hulk, X-Factor) to concoct a plot to connect potentials of its Multiverse for current and future events. Dennis Hopeless, Gerry Conway (Legion of Super-Heroes, Metal Men), Michael Costa, Robbie Thompson, Roger Stern, Skottie Young and Tom Defalco also joined in for side-stories and tie-in issues from various ongoing volume and limited series. Artists Giuseppe Camuncoli (Superior Spider-Man – My Own Worst Enemy, Superior Spider-Man – Necessary Evil), Humberto Ramos (Champions – Change The World, X-Men – Apocalypse Wars) and Olivier Coipel (Avengers Vs. X-Men, Siege) took on the illustration duty for delivering some mind-blowing moments within the issues they worked on. For additional back-up, artists Adam Kubert (Onslaught Saga, Origin II), Dave Williams, Greg Land, Mark Brooks, Miguel Sepulveda, Paco Diaz and Ron Frenz (Spider-Man – Hobgoblin Lives, Spider-Man – Revenge of the Green Goblin) checked in.